Dome of the Texas Capitol in Austin — shot one sunny day while trying to convince legislators to open adoption records to adult adoptees like me. My husband’s family has been in Texas so long that if you walk into the Alamo, there’s a quote by one of his ancestors up on the back wall (“Let me give my life for Texas” – Tapley Holland). Mine was here waiting for them when they got here, having come in with Col. Austin’s “Original 300” settlers. But most of the time, I’m not the proudest Daughter of the Texas Revolution in the state. In fact, a lot of times the nonsense that passes for state government in the Lone Star State leaves me thoroughly ashamed of my home state. Not today. Today, to quote my mother, I’m as pleased as punch to tell anyone thinking of trying to SLAPP a Texan into submission that they’d better have another think coming. The Texas legislature got it right, with the passage of one of the strongest anti-SLAPP bills in the country. 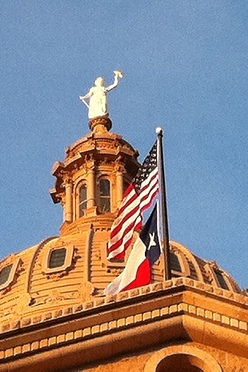 Surprisingly enough in the contentious Texas legislator, the bill passed unanimously. The bill, called the Citizen Participation Act, actually takes protections for public speech (including blogs, social media commentary, and other online “speech”) a step further than the California anti-SLAPP law, which was the most progressive in the nation until now. SLAPPs (Strategic Litigation Against Public Participation) are frivolous lawsuits filed by big, powerful individuals or organizations against critics. The classic SLAPP suit is the big developer who sues an environmental activist who speaks out against a development project. But anytime Goliath sues David, it may be a SLAPP. For more information about SLAPP Suits, visit the Citizen Media Law Project’s excellent archives. SLAPP suits have been filed about all sorts of things. Glenn Beck sued a satirical website in 2009, just two days after it went up, and ultimately obtained ownership of the parody site so that he could shut it down. A woman involved in a medical malpractice case who documented her litigation and recovery on a website was sued by her doctors. A homeowner who complained about contaminated drinking water spent almost five years in court defending herself against defamation claims by a landfill operator. I could keep listing these lawsuits all day. Now that Texas is at least considering protecting Texan’s free speech rights, I can at least hope that the list will someday stop growing. If Texas — hardly the most progressive of the 50 states — is passing this legislation, surely a Federal Anti-SLAPP law can’t be far behind. Join me on May 19 for a free webinar on compliance issues in online marketing and social media. Details & registration are online here. Gallery | This entry was posted in Law and tagged Barbra Streisand, blogger rights, Dan Snyder, Deb McAlister, First Amendment, Fred Holland, free speech, Glenn Beck, libel, SLAPP, SLAPP suit, Tapley Holland, Texas law, Texas legislature, the Alamo, Washington Redskins. Bookmark the permalink.